The Ecobee4 and the Nest Learning Thermostat Gen 3 are two of the most popular smart thermostats on the market, each of these devices challenging both the design and the functionality of the traditional thermostats which were plain looking, configuring them was unnecessarily complex and they were generally a mess (the large majority of people did not even bother with changing any settings, they simply manually adjusted the temperature and nothing more). 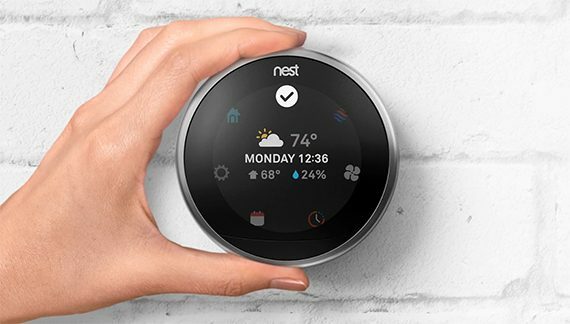 The Nest Learning Thermostat and the Ecobee4 aren’t really the first smart thermostats on the market, since other manufacturers have also tried their hands at building a well-rounded device, but these two have managed to come as close as possible to what the regular user was craving for a long time. This way, both thermostats rely on various internal sensors to get accurate readings of the temperature and to detect if there are any people in the vicinity, both devices can be integrated into a small home environment and can be monitored and configured using a mobile device, but each of them has some advantages over the other. Just as its name suggests, the Nest Learning thermostat learns your habits and predicts which temperature would suit you best and it also has a great design with a very intuitive way of interacting with the software, while the Ecobee4 has integrated the Alexa capabilities and has an extra remote sensor to help for better whole-home temperature readings. That being said, let’s see which is the better smart thermostat. Note: You can also check out the individual analysis of each smart thermostat here: Nest Learning Thermostat 3rd Generation and Ecobee4. The traditional thermostat usually had a rectangular plastic body, with a small black and white display and a ton of buttons which often managed to confuse the user rather than making it easy to adjust the temperature or set up schedules. 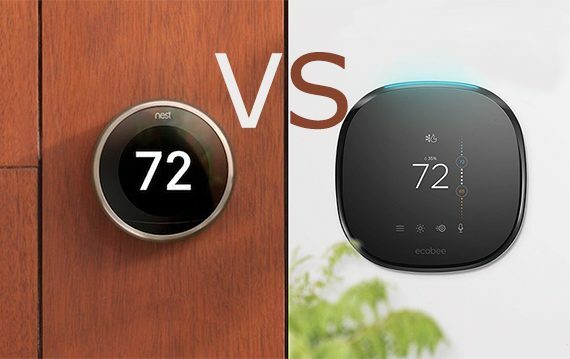 The manufacturers of both the Nest Learning Thermostat Gen 3 and the Ecobee4 have managed to create better design formulas by migrating away from the expected industrial look and this time adopting a more simple, minimalistic approach (similarly to how the WiFi systems have evolved from the regular routers). The Nest Learning Thermostat Gen 3 features a cylindrical metallic case surrounding a circular screen (the case comes in copper, black, white and stainless steel) and, in order to operate the display, you’ll notice that Nest did not go the touch-screen way, instead implementing a mechanical dial which masquerades into the exterior metallic shell (the rotating mechanism is very easy to use and it feels reactive). Perhaps the only complaint would be the relatively large bezels that surround the display, but the screen has grown in size from the last generation and it is actually of respectable size when comparing it with the Ecobee4, which has a smartphone-sized display and a really huge unused screen-estate. 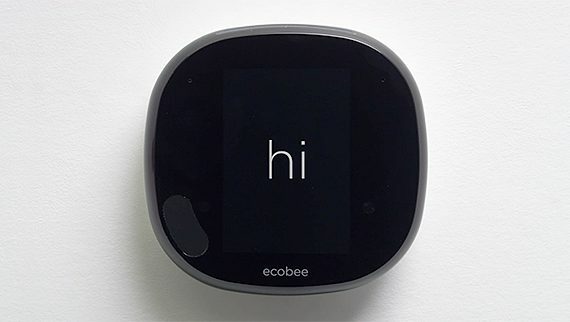 The Ecobee4 maintained the same tone as the previous generation, so the case is still made of plastic and with a large glossy front section, where the touchscreen display rests. I wouldn’t say that one system is better than the other, but the rotating dial and the light push on the edge (for validating a specific option) does feel satisfying to operate and a lot more reactive than the touchscreen display of the Ecobee4 (don’t get me wrong, it still works just fine for operating the interface). 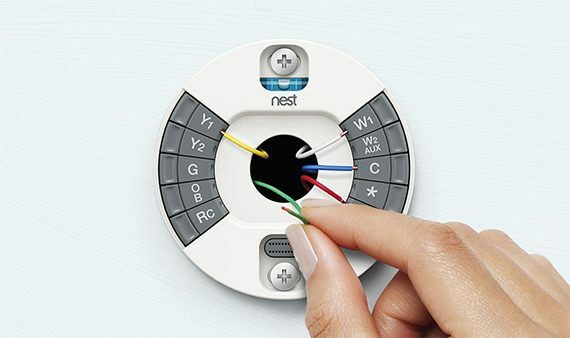 Although the quality of the display shouldn’t really be a decisive factor, since, ideally, the user would rarely need to adjust the parameters of the thermostat, it is worth noting that the Nest Learning Thermostat has a 2.1-inch LED display with a resolution of 480×480 pixels and a 229 ppi pixel density (the colours are decently accurate and, in case the sun shines directly on the screen, the Sunblock feature ensures that the temperature isn’t falsely risen and that you still get accurate readings). The Ecobee4 has a 3.5-inch display with a resolution of 320 x 480 pixels, which is decently sharp and the text looks crisp. It’s true that the display is bigger than what Nest has to offer, but taking into account the screen-to-body ratio of the Ecobee4, it will seem smaller (4.29 x 4.29 x 1.0 inches of the Ecobee4 as opposed to the 3.3 x 3.3 x 1.2 inches of the Nest Learning Thermostat). Besides the display, the Ecobee4 also comes with a built-in microphone and speaker to allow the user to take advantage of the Alexa integration (besides the usual functions, you can also play music, but, since the speaker is very weak, I advise against it). If you don’t have an Alexa hub inside your home, then this will prove to be a welcoming addition (you would have to carefully think where you mount the thermostat, since you don’t want to shout at it from 20-30 feet away), but, if you have some Alexa hubs, then you may want to disable this function on the Ecobee4 since it does not have the Echo Spatial Perception ESP feature, so when you ask Alexa something, the thermostat will answer regardless of the other hubs location. On the rear side of the Ecobee4, there are some vent holes which ensure that the manufacturer thought about delivering a proper heat management. The Nest Learning Thermostat does not seem to have any cut-outs for the ventilation, but I did not yet notice any attempts at overheating. While the Ecobee4 has an advantage over the Nest with its Alexa features, the Learning Thermostat does have an interesting element that will prove useful in various occasions: a rechargeable built-in battery that will keep the device running in case of a power outage (or other electrical problems) for at least one hour – the moment the battery gets close to empty, it will gradually disable some functions to ensure some basic functionalities as much as possible (such as turning off the WiFi). Verdict: Both the Ecobee4 and the Nest Learning Thermostat are guilty of little to no changes over the last generations, but each of these devices can still pride themselves with a modern design that won’t go out of style for a long time from now. The most obvious advantage that the Ecobee4 has over the Nest is the Alexa integration which I wouldn’t really call it a necessity, but, while it can be useful as an extra feature, it won’t necessarily improve the smart thermostat aspect in any major way. 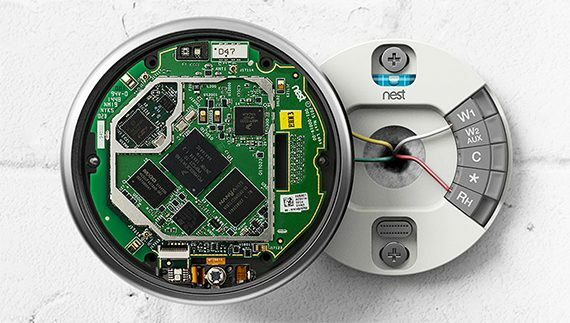 At the same time, the Nest Learning Thermostat does have a better interface navigation system (the mechanical dial over the touchscreen), the metallic case feels more premium and the internal battery are enough to outweigh the Ecobee4 from the design point of view, so Nest wins this round. The hardware installation process of both the Nest Learning Thermostat Gen 3 and the Ecobee4 is pretty much identical: you need to disable the heating, ventilation and the AC systems and remove the old thermostat to expose the terminal with all the necessary wires – make sure you label them before being removed from the terminal (if the older thermostat used high voltage or stranded wires, then you won’t be able to use either of the devices, since they’re not compatible). From here, there are two ways to continue: if there is a C wire, then you’ll use it to power up the new thermostat, but if there isn’t one, do not fret, since both the Nest and the Ecobee4 will work just fine without it (Nest will get its power from the HVAC system and the Ecobee4 gives you a power extender kit to make things a lot easier). The next steps (with a C wire) will require that you connect the wires to the appropriate terminals, attaching the mounting plate on the wall using the provided mounting kit and lastly, you need to push the thermostat into place until you hear a click (available for both Nest and Ecobee4). As always, it is advisable to call a professional for a worry-free install (especially since there may be some unexpected steps that need to be taken), but, if you know what you’re doing, you should be able to finish the installation in about half an hour. After the hardware installation is done, you can perform the initial set up and navigate the interface of either thermostats in order to adjust some additional settings. 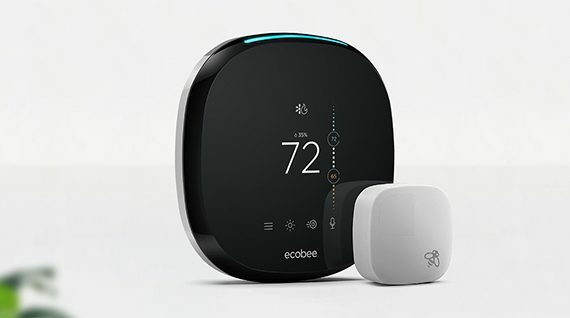 The Ecobee4 allows you to monitor the humidity level, view and adjust the indoor temperature, as well as adjusting the System Mode (can be Auto / Cool / Heat / Off); you can view the general parameters, configure the sensors, create schedules and reminders or manage the Vacation options; there is also a direct connection to the Weather forecast and you can manage the Voice Control feature. The Nest Learning Thermostat gives you a similar experience, so the user can also adjust the temperature, see different stats (such as the mode, the date/time and the temperature), explore a number of icons which make it easy to configure the thermostat (create schedules for the fan, modify the placement, view the energy consumption and more) and it allows the user to enable the Home / Away Assist feature that has the role of detecting when no one is at home, so it doesn’t use more power than necessary in order to either heat or cool down an empty home. The Nest Learning Thermostat Gen 3 also comes with a number of sensors (humidity, temperature, ambient light, near-field and far-field activity) and it has implemented the Nest Sense technology which, ideally, it should be able to get accurate temperature readings over a larger area so, over time, it can create a profile of your habits and other types of ambient patterns in order to learn and predict the best temperature at any give hour. In reality, while the concept is good, the Nest Learning Thermostat just can’t accurately know the suitable temperature in every room, which means that more often than not, you’ll end up either sweating or in need of an extra blanket (depending on how large the house is – the thermostat gets decently accurate readings from one location). This is where the Ecobee4 gains a significant advantage, because, besides the four internal sensors (for humidity, temperature, occupancy and proximity) that help the thermostat get accurate environmental readings in the close vicinity of the device, it also has provided an extra remote temperature and proximity sensor (additional sensors can be purchased separately) which sends accurate statistics of both the temperature and if someone is in the area, therefore nullifying the possibility of either heating up or cooling down the home at the wrong time. Furthermore, similarly to the Nest Learning, the Ecobee4 comes with the Home/Away feature that temporarily overrides your settings when no one is at home and, the remote sensor will also better detect if someone is in the house (unlike Nest which is prone to false readings). Note: Each of the two thermostats offer an app (compatible with both iOS and Android OS) which allows the user to remotely configure and monitor their device. Inside the case, the Ecobee4 comes equipped with a NXP MCIMX283DVM4B Embedded MicroProcessor (454MHz), a NXP MKL15Z128VLK4 Micro-controller, a 2.4GHz Atheros transmitter antenna and a 902 MHz transmitter antenna (the thermostat supports the 802.11 b/g/n WiFi standard). 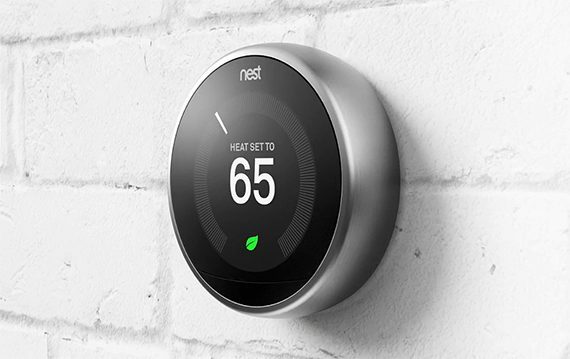 At the same time, the Nest Learning Thermostat is equipped with 512MB of RAM, has a BlueTooth Low Energy radio, as well as a 2.4GHz radio (802.11b/g/n) and a 5GHz radio (802.11a/n) for a suitable WiFi connection. 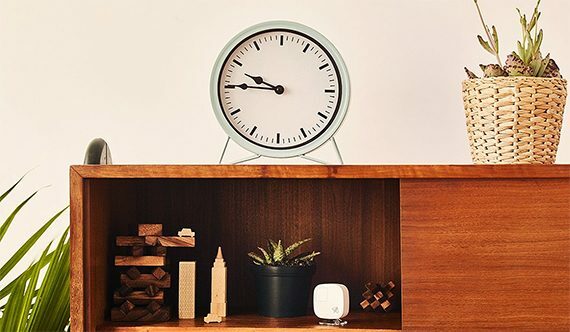 The device will easily communicate with the other Nest products and it will also work with a series of smart hubs (to facilitate a proper integration within a smart home environment), such as Google Home, Samsung Smart Home, Wink, Amazon Alexa, other IoT devices (such as products from Yale, TP-Link, Philips, LIFX, Chamberlain, Skybell, Lutron and more) and it also supports the IFTTT protocol. The Ecobee4 has a broader reach, so it supports Alexa hubs, Apple HomeKit, Samsung SmartThings, Wink, LogiTech Harmony, Vera, Control 4 and a lot more (it also supports IFTTT functionality). Verdict: From the software point of view, both the Ecobee4 and the Nest Learning Thermostat 3rd Gen offer a similar experience, each of them managing to deliver a good, user-friendly experience. Furthermore, the installation process is pretty much identical, so neither gains any advantage at this point, but it gets clear that, while Nest offers lots of features and tries to overcome its location weakness with various ‘learning’ algorithms, it just can’t raise up to the more accurate Ecobee4 which can easily manage to read the temperature in every room (thanks to its additional remote sensors), so it’s not bound to a single location. Additionally, Ecobee4 will work with a broader variety of hubs and IoT devices, so it effortlessly wins this round. The Nest Learning Thermostat has been the number one choice for the people that desired a reliable smart thermostat for very good reasons: the metallic case and the elegant design was an eye-candy element, while the rotating dial was and remains one of the best ways of interacting with the interface; the sensors and all those smart features will prove to be enough for a smaller house, where it’s easier to guess the best temperature, but it has shown its weakness in medium to large homes, where the temperature in the bedrooms will rarely coincide with that of the hallway. 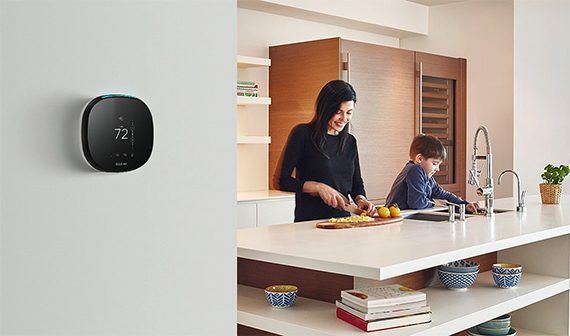 The Ecobee3 was already the device that managed to switch the attention from the Nest with its additional remote sensor and the Ecobee4 has just taken things one step further and besides featuring a better temperature predicting system, it has also included the Alexa capabilities, which can be an advantage for people that do not own an Alexa hub already (otherwise, it can actually be an inconvenience). I have no doubt that the nest generation of the Nest Learning Thermostat will have more radical changes and that it will once again aim at being the best smart thermostat on the market, but, in the meantime, the Ecobee4 takes the crown.